In my photo tramping around Altkloster, I have come across many interesting facets of railway operation. Here on the east side of Altkloster, behind the electric engine shed, is a loading facility, using an open air ramp and loading dock. 1. It needs to be alongside any track (on some occasions, on a main line or loop), or at end of a stub track, or siding. Example at end of siding. 2. It must be built at a useful height to unload from the deck of road trucks at ground level, and also have a height that makes the top of the loading area level with the floor of flat wagons and box cars. 3. It might often have a ramp up to the loading level, so that wheeled vehicles or machinery can be wheeled on to flat cars (sometimes using planks), or into large door box cars. It is a very easily modelled item, I use a piece of wood. Cut off one end at an angle for the ramp. Then surround it with brick paper, or scribe it with wood planks, sometimes with vertical wood pieces to reinforce the planks. Then glue sandpaper to the top, so it looks like bitumen or gravel. Sandpaper normally comes in a huge range of colours and textures. 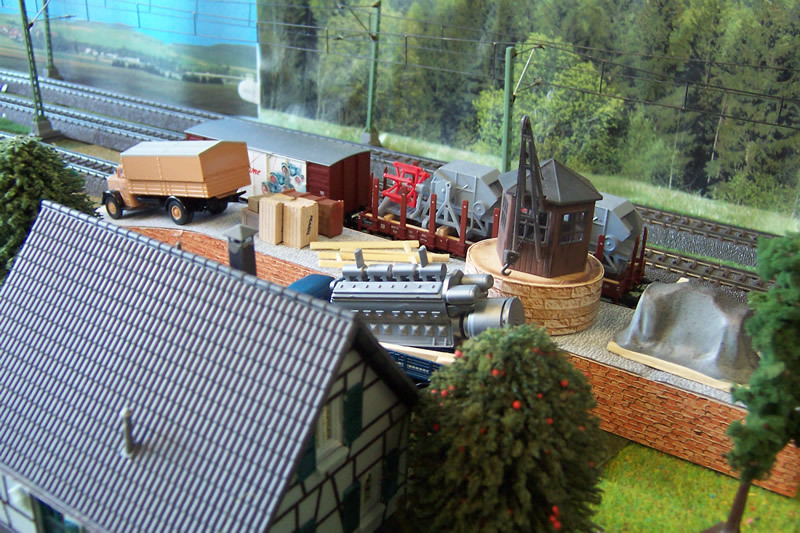 In my Altkloster layout, I also placed a small swivelling crane on the loading area, to handle heavy objects. The double track mainline is in the background. In this photo I took at the end of the fifties, the boxes have been unloaded from the truck, and have to be put in the van. The harvesting machinery has already been wheeled into position on the flat car, and the stakes inserted in the blocks to help keep the load secure. Note the timber lying around on the load area, to help with securing loads, and for packing. The floors of flat and box cars were usually wood so the timber packing could be nailed down with long nails. In these scenes, all the workers have gone to lunch. A large engine that has been brought to the loading facility on the back of a M.A.N truck, has to be secured on the crane hook with slings, and then an empty railway gondola, open wagon, or stake wagon will be positioned to carry it.